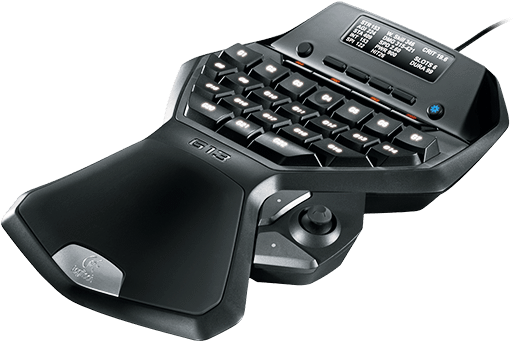 I received a Logitech G13 Gameboard as a Christmas gift. I did a quick test on a handful of games and got mixed results. Games with pre-made profiles seemed to work fine while those I tried with the default or a custom profile often failed. In some cases the gameboard keys simply did nothing while in others the cursor/character would move continuously with nothing pressed as if a direction key were being held down. I’m using the gameboard on a 2009 iMac with Mac OS X 10.8.5 and the games I was testing were all launched through Steam. While I found a number of hits on G13/Mac/Steam issues, they all turned out to be from the time of the initial launch of Steam on OS X and were no longer relevant. Eventually I determined that the source of the problem was the built-in joystick. The default profile has keys mapped to the joystick axes. Even though the joystick was centered, these keys seemed to be constantly triggered, perhaps due to the games misinterpreting the joystick as a full game controller. I fixed the issue by switching the joystick mapping in the default profile from individual keys to simply “joystick” within the Logitech software. Interview with Rob Wiethoff, the voice of John Marston on Red Dead Redemption. Just a quick radio interview, but it was an interesting combination of an actor from one of my all-time favorite games being interviewed by an actor from one of my all-time favorite web series (Doraleous and Associates).